Fisher-Price Little People Toys have been a big hit with both of my sons, and you will hear that same sentiment reflected from numerous other parents (at least the five that I have talked to). The reason this brand of toys have been so popular is because of the wide variety of choices and characters you can pick from. 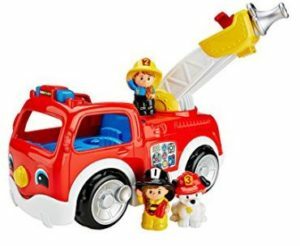 From fire fighters to pirates, there is a Little People Toy set for everyone. Below is a list of our favorite choices. These aren’t necessarily in order of what’s best to worst, but more of a comprehensive list of the great options you can pick from! Below this quick reference chart is a more detailed review of each one if you need to learn more. Enjoy! 30 of the Best Little People Toys! 1.) Little People Fire Truck– This is just your classic fire engine truck. It includes a fire ladder that swivels around, as well as a bucket seat on that ladder that moves up and down. The toy plays over 25 different songs and sounds, plus it moves really well when racing it! You also get a couple of fire fighter figures and a fire fighter Dalmatian puppy that comes with it. There isn’t much not to like here – and this toy has brought lots of enjoyment to my household. For more specifics on this toy, check out our much more detailed review on it! 2.) 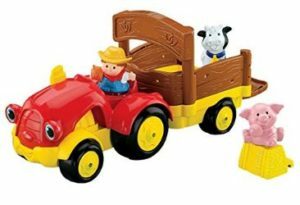 Little People Farm Set – This isn’t a vehicle, but rather a really fun farm play set. This toy is a large barn that opens up, with a silo attached to it on the right hand side. There is a handle attached to the top of it, which allows it to easily be carried around by your child when it’s snapped shut. The silo is a fun place for your child to dump toys and farm animals into. 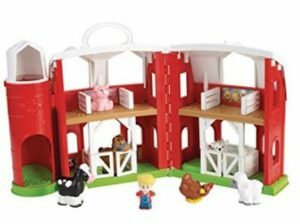 Besides just having a well-built red barn to play with, this toy comes with the farm animals you would expect (including a chicken, cow, goat, pig, horse, sheep, a farmer, and even a bale of hay). 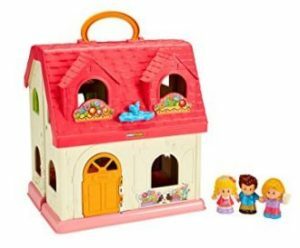 This toy is a real winner because you get both the barn and animals needed to have a fun play farm! This is also a toy that we did a full review on here! 3.) Little People Toy Zoo Train – One of the first toys we ever reviewed on this site was the Little People Toy Zoo Train. That toy is still played with on a regular basis in my house. The train itself moves really fast on the carpet, and it has multiple buttons you can push to play different songs. The toy comes with a couple of different animals and a conductor- and you can even put the animals in the driver’s seat if you want. Besides animals, you can give all sorts of different toys a ride in the back. 4.) 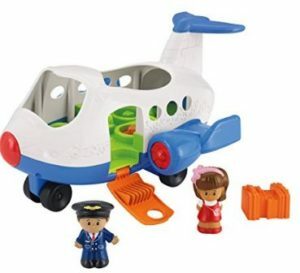 Little People Toy Airplane – One of the more iconic Little People Toys is the Little People Toy Airplane. This toy looks just like an airplane and there has been numerous variations released over the years. The version we own plays one of the most annoying songs ever – but our kids love it. It comes with a pilot, some passengers, and some luggage and really encourages some imagination flying time. If you are looking for a fun airplane toy for your child, it’s hard to beat this one. 5.) Little People Toy Camper – Do you want a Little People Toy that makes lots of noise and sings lots of songs – than the Little People Toy Camper is for you! It comes with over 50 different songs and outdoor noises. The camper itself opens and closes. When closed, it moves around really well on its wheels, and when open it becomes an outdoor camp ground. 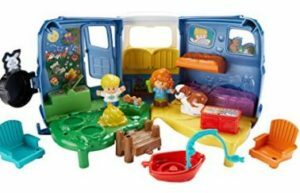 The set includes bunk beds, a picnic table, a campfire that glows, chairs, a fishing dock, a boat, and even a fishing pole. Lots of creative things you can do with this toy! 6.) Little People Tow ‘N Pull Tractor – This toy is your basic tractor that has a wagon attached to it, and can be pulled and pushed very easily. It has a “pop up” pig that will pop up out of the hay in the wagon when the tractor is pulled. It also comes with a farmer and a cow. Very nice toy that is really good for younger children. 7.) The Little People Surprise & Sounds Home – This toy is a home that can be opened and shut. When it is closed, it does have a handle on the top that allows you to carry it around. When open, you have a house with multiple rooms and lots of fun noises for your child to discover. For example, if you lift the toilet seat you hear a flushing sound. There are over 50 sounds it makes! 8.) 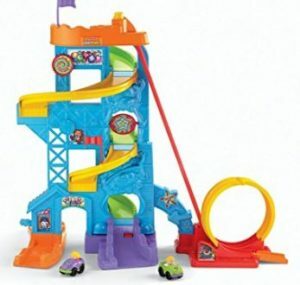 Little People Amusement Park Playset – This really fun activity set has multiple slides and a loop to ramp vehicles on and off of. It is two sided, and stands right around two feet tall. When you send the car down the roller coaster ramp it makes lots of noises and the toy lights up. This toy does include 2 vehicles plus the amusement park set. This toy does require 3 AAA batteries to run. 9.) 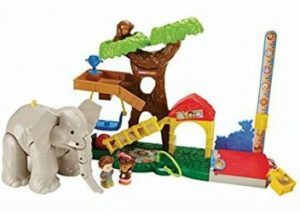 Little People Going Camping Playset – This playset comes with all the toys you need to create a fun camping scene. It has multiple people, a moose, picnic table, cooler, tent, sleeping bags, SUV, Trailer, and an ATV! It also has fire pit that you can push the sticks down on to “start a fire” and pull them back up to put out! It is a lot of fun for children with big imaginations. 10.) 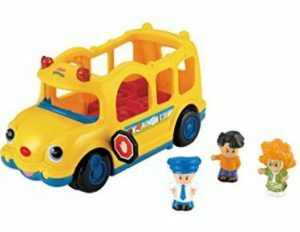 Little People Lil’ Movers School Bus – The school bus is just a fun toy for younger children to push around and play with. It includes 3 characters that go with the bus, and when you push down on the driver seat all sorts of sounds and lights will start playing. The figures will start wobbling when they are seated inside of the bus. The bus itself moves well and looks really good, which is why children enjoy this toy so much. 11.) Little People Swing & Share Treehouse Playset – This is a super fun toy for children to play with, even I played with a similar style toy 30 years ago. 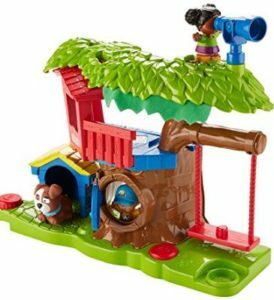 The treehouse set comes with two toy children and a toy dog. It has lots of swings and platforms for those figures to play on – and it even has a trapdoor. There are buttons that play songs and sounds – plus make the swing move back and forth. Great all around toy for children. 12.) 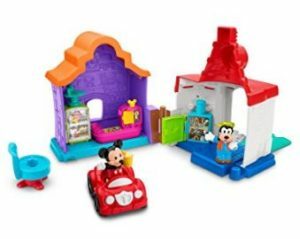 Fisher Price Little People Disney Mickey & Minnie House Playset – I know my child loved the Mikey Mouse Gang during his early years, and this toy would have been a blast for him to play with. 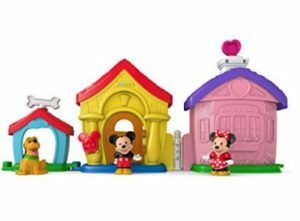 It has Mickey, Minnie, and Pluto – as well as a pink house for Minnie, a house for Mickey, and a dog house for Pluto. For children that love Mickey Mouse, they will enjoy this toy. 13.) Little People Big Animal Zoo – The Little People Big Animal Zoo is a ton of fun! It has a big tree, a swing, and other nice additions to it. It also comes with a large elephant, a monkey, zoo keeper, and 2 toy food pieces. Like most Little People Toys, this one lights up and makes noises – and has fun little activities built in that are waiting to be discovered! 14.) 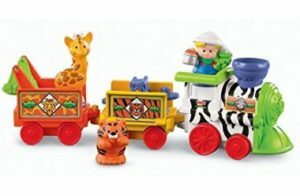 Little People Musical Zoo Train – This is designed a little differently than the Zoo Train listed above. This one reminds me more of a circus train. It comes with the train engine plus two carts to pull, a conductor, and a toy tiger and giraffe. 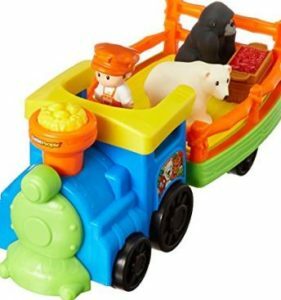 What kid doesn’t want to pull toy animals in a fun looking train! 15.) 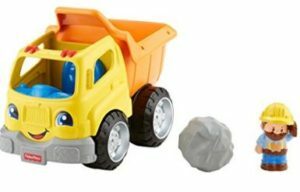 Little People Dump Truck – This is a fun little toy that kids who love construction equipment will enjoy playing with. It comes with a construction worker plus a boulder that you can load up into the back of the truck. When you press down on the driver’s seat you get truck sounds, phrases, and music. It is a great addition to any kid’s toy car collection. 16.) Little People Mickey & Goofy’s Gas & Dine Playset – Another great Disney Little People Toy, with this one involving Goofy & Mickey. It has a little dinner and a garage, plus a Mickey Mouse figure, Goofy Character, small car, and diner chair. The set does fold up for easy storage, and the garage door opens up. 17.) 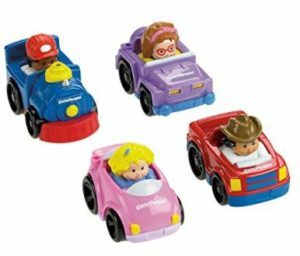 Little People SUV – This is a fun toy for children, and it is well-sized with dimensions of 10.2 x 5.6 x 8 inches. 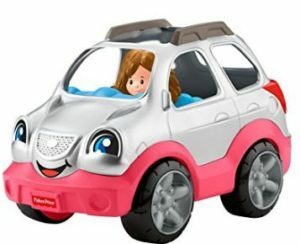 Included is a toy figure, and the SUV will make different sounds and noises. The truck also opens and closes. It is a fun, inexpensive option that can be driven around all over your home! 18.) 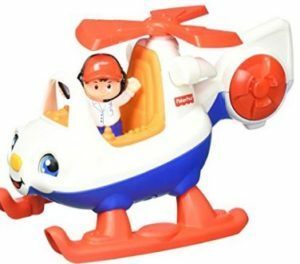 Little People Toy Helicopter – If you are looking for a fun helicopter toy to zoom around your house, pick this one! If you press down on the driver’s seat you will hear 8 different helicopter noises. This toy is going to include a pilot and the helicopter – and it should go on a lot of fun adventures in your home. 19.) 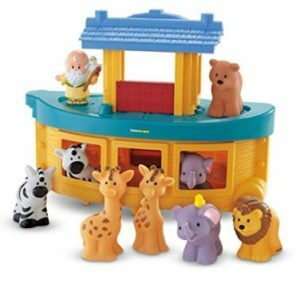 Little People Noah’s Ark – This fun Ark comes with the boat plus 9 toy figures – Noah, and two Elephants, two lions, two zebras, two giraffes. The toy Noah and animals give you child the ability to recreate the famous Bible Story, or give you child the opportunity to play lots of fun games. 20.) 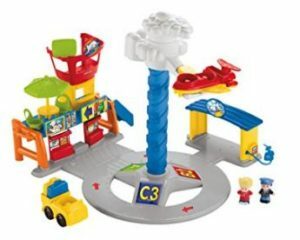 Little People Spinnin’ Sounds Airport – This is a really fun airport playset. This version comes with a small airplane and baggage cart – plus a pilot figure, passenger figures, luggage pieces, and a table and chair. The plane connects to the cloud, and if you hit the cloud it will spin around. It makes all sorts of fun noises and phrases, which will make it a lot of fun for most young children. 21.) 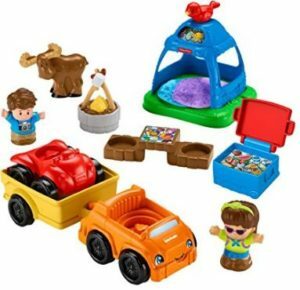 Little People Caring for Animals Farm Set – This toy is very similar to the above farm set, but with a little more modern look and it makes a lot more noises. 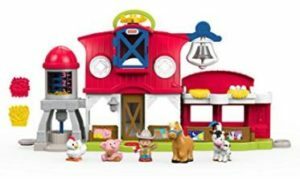 This barn set comes with a farmer, pig, chicken, horse, and a cow with a calf. It has a hayloft that opens up and you can drop items into, and you also have a silo that rotates. You also have fun animal noises, songs, and flashing lights when you open and closes things! 22.) Little People Wheelie Truck Set – If you want to have a variety of vehicles for your child to drive and crash around, picking a set like this is a great idea. This set comes with four trucks, with one of them shaped like a train. The figures are built right into the vehicles, and it is a great starter set. 23.) 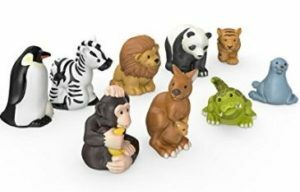 Little People Zoo Animals – If your child loves animals, and you are looking for more animals for your farm set or zoo space – this is a great set of toys. This has 9 animals including a penguin, zebra, lion, panda, tiger, monkey, kangaroo, alligator, and seal. They can also be used in other little people toys like the zoo trains. 24.) 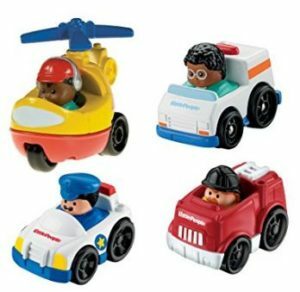 Little People Wheelies Community Helpers Pack – This is another set of toys that your child should have a lot of fun with. You have a helicopter, police car, fire truck, and ambulance – all of those toys are things that children love! They mover really well, even the helicopter with its wheels! 25.) 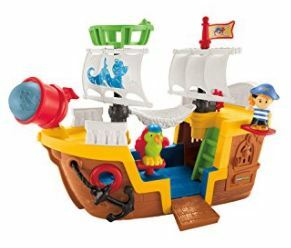 Little People Lil’ Pirate Ship – This is a fun pirate ship that has a cannon, pirate figure, parrot, and of course a cannon ball that the cannon shoots. It is hard to imagine how your child wouldn’t love incorporating this toy into their adventures! 26. Little People Floaty Boat – This fun toy can be used in water or on dry land. The boat really does float, making it a great bath toy. 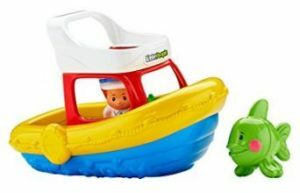 Included in the set are the toy boat, toy captain, and a toy fish. The fish will squirt water, and the boat includes a fun little steering wheel! This is a toy we highly recommend for bath time! 27. 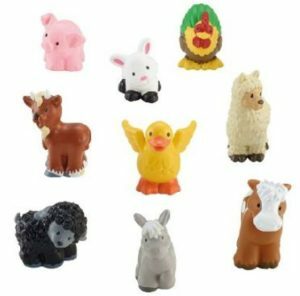 Little People Farm Animal Friends – This is another toy set geared for kids who love animals. This one is all about the farm animals, with the set including a pig, rabbit, turkey, goat, duck horse, and more! Great addition to any farm set. 28.) Little People Christmas Story Set – This is a really fun, Christmas Story themed toy. 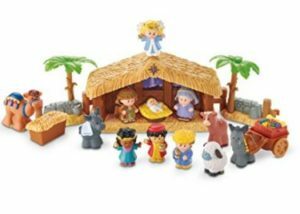 It includes a toy manger that comes with Joseph, Mary, Baby Jesus, an Angel, the 3 wise men, two donkey, a camel, sheep, and a cow. It does light up and play “Away in the Manger.” Could be a great Christmas gift as well! 29.) 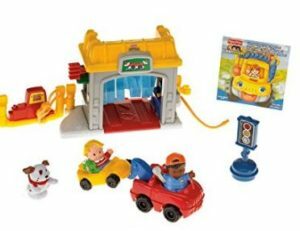 Little People Mini Garage – This is a fun toy garage that comes with a tow truck, a car, a couple of figures, and a garage for your child to repair cars in! This toy is really good for imagination time, and should bring plenty of enjoyment to your child! 30.) 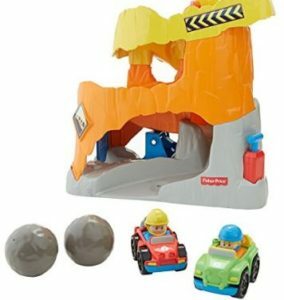 Little People Off Road ATV Adventure – This is a track made for younger children, but it includes a couple of cars with figures insides, a couple of boulders, and a race track for them to ramp on and off of. There are a lot of fun things built into this toy that should be a lot of fun for your kid! We know we may have missed some of your favorite Little People Toys – so if you see a toy you think should be on the list, please let us know!